That wasn't what I'd expected. I actually paused it halfway through to check that I was watching the right thing and not a mainstream Fate/stay night movie instead. (Fate/stay is a grim magical deathmatch franchise in which almost everyone dies, whereas Fate/kaleid is a lighter, fluffier and funnier magical girl spinoff in a different reality. Personally I think "stay night" is okay and "kaleid liner" is brilliant, one of my all-time anime favourite series.) As it happens my worries about this film were misplaced, but even so I wouldn't personally describe this as a Fate/kaleid liner Prisma Illya movie. It's not even set in Illya's universe! She herself isn't glimpsed for more than a few seconds and the film's hero is instead Shirou Emiya as you'd expect from Fate/stay night. He fights in another Holy Grail War. His adoptive dad's still Kiritsugu and his school friend's still Sakura Matou. It's Fate/stay night with a twist at the end, basically. 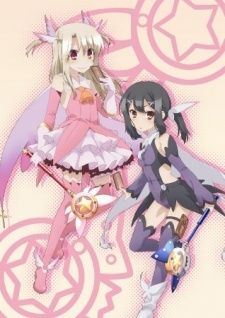 That said, though, you need "Prisma Illya" in the title because of the links that are revealed at the closing credits. Those are a big deal, but that needed flagging up somehow since they won't have as much weight to anyone unfamiliar with Prisma Illya. We begin with a natural disaster. Emiya and his adoptive father, Kiritsugu, see a city get devastated by a... something. It's black and whirly. Typhoon? Tornado? Let's call it a vortex. However they go into the city anyway and find the small girl they'd come here looking for. Emiya calls her Miyu, but Kiritsugu calls her a "thing" and a reality-changing magical entity that will let him save the world. If the stakes are as big as that, who cares about a few lives? We don't know what he means by that, but it doesn't sound good. Apparently mankind is heading for disaster and the only correct long-term goal is to prevent this ultimate doom. Anyway, Kiritsugu certainly doesn't won't let Emiya do anything so sentimental and dangerously human as let their human-shaped tool celebrate its sixth birthday. Emiya's not happy about this. He calls Miya his sister. Miyu is a bit more reserved and doesn't call him "big brother" (as would be normal for siblings), but "Emiya". What ensues is straightforwardly Fate/stay night. There are nice people and bad people. We like the former, but there will be bloody death. There's a Holy Grail War, which to be honest I've never seen the point of. It might grant your wishes. Well, whoopie doo. It's much more likely to get you killed, along with all your friends, family and neighbours when a vortex tears your city apart as per the end of the Fourth Grail War. To be honest, I was disappointed. I'd been hoping to see Prisma Illya. More specifically, I'd been hoping for a continuation of the TV series, which is currently looking a bit dead. There was a Prisma Illya TV series every year from 2013-2016 and it ended with the story unresolved in "3rei! ", but this film isn't continuing anything and I hadn't heard any announcements for "3rei Herz!" Let me google... ah, thank goodness. Looks as if I hadn't been paying attention. There will be more Prisma Illya anime, but the "3rei!!" manga arc is still running and perhaps they're waiting for that to finish. Besides, apparently this film is an adaptation of a "3rei!!" manga flashback arc (chapters 31-43) that happened to be so standalone that they decided to do it like this. That's got me considering buying the manga, though. I love Prisma Illya, so why not? It's a pretty good film, I think, with a good Emiya Shirou. My disappointment had only been because it's not what I'd been expecting. That said, though, to get the most from this film, I think you'd probably need to know both Fate/stay night and Fate/kaleid liner Prisma Illya. Newbies would understand it, mind you. The plot's simple and the emotions are strong, but I think you'd miss a lot if you couldn't see the resonances with the rest of the mythology. It's a bit dark, drab and dour in that Fate/stay night way, but I think I liked it and the ending hit me hard.